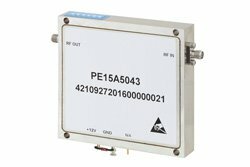 RF solid state power amplifier (SSPA) PE15A5043 from Pasternack is part of the largest selection of in-stock radio frequency microwave and millimeter wave amplifiers available for same-day shipment. This Pasternack solid state RF power amplifier is a high power amp design constructed in a connectorized package. Our SSPA is designed with SMA connectors and rated at 7 Watts. 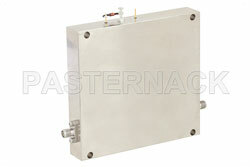 Pasternack solid state power amplifier part number PE15A5043 SMA high power amp has a 30 dB minimum gain. The high power medium gain amp is rated with a P1dB of 38.5 dBm. Our radio frequency high power solid state amplifier is constructed for minimum frequency of 8.5 GHz and a maximum frequency of 11 GHz.